Michael Gentilucci's centering sculptures bring peace, humor, and the art of Zen to off-kilter spaces. 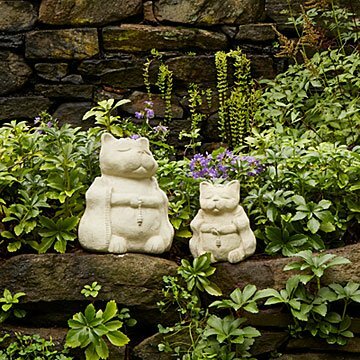 These kitties lend stressed-out outdoor spaces a helping paw by adding that necessary dose of tranquility through their calming, yet distinctively feline presence. To add even more cat-like charm, the Chinese characters etched into the back of each kitten's robe are indicative of the animal's primary characteristic—independence. Michael's meditative sealed cement sculptures are designed to weather the elements through the four seasons as they center greenspaces with their amiable auras. Handmade in USA. Standard: 5" L x 5" W x 5.75" H, 4.5lbs. ; Large: 7" L x 7" W x 9" H, 14lbs. Have now given these as a gift twice! Perfect Christmas gift for someone who is impossible to shop for and a new housewarming gift for my parents. They are quirky, stand up to some heavy snow, rain, and wind, and are the perfect size. Great gift for cat lover. Looks cool outdoors! It was a gift and the recepient is excited to use in their new garden area. This was a Christmas gift for my brother who loves animals and is always in his garden and yard. He loved it. It's very attractive and well-made. It's the perfect size for a cat lover's patio garden. Looks great in the yard or on a porch or deck. Great size and really cute design. Seems very sturdy and is a perfect addition to my friends porch. In Florida we spend a lot of time outside so she will have plenty of time to enjoy it. Perfect gift for what I was looking for!